One of my earliest essays on “Professional Southerner” was about the peaches of Chilton County, Alabama, and the family-run peach stand of the Harrison family. I made my first “peach run” of the season last week and, in honor of the 2015 peach season, I am going to revisit that 2014 essay. I get a little reflective as the Alabama peach season draws to a close. The state of Georgia, of course, has appropriated all of the peach titles and has done an admirable job of marketing its peaches as if they are something special. But a growing number of Southerners have discovered the rich and considerable delights of peaches grown in Chilton County, Alabama. On a May morning in the French Market in New Orleans a few years ago, I was pleased to hear a local shopper ask a vendor if any Chilton County peaches had arrived yet. He replied that he didn’t have any but that the lady a couple of stalls down had just gotten her first delivery of the season that very morning – “and they sure are good this year.” The shopper grinned like a child on Christmas and rushed to buy a basket. 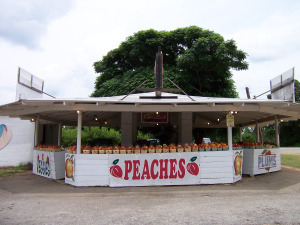 This entry was posted in Chilton County peaches and tagged Alabama, Alabama peaches, Harrison Farms in Chilton County, the south, travel, US Hwy 82 on May 26, 2015 by gedwardjourney.